A windshield view of the underpass on Dec. 17. 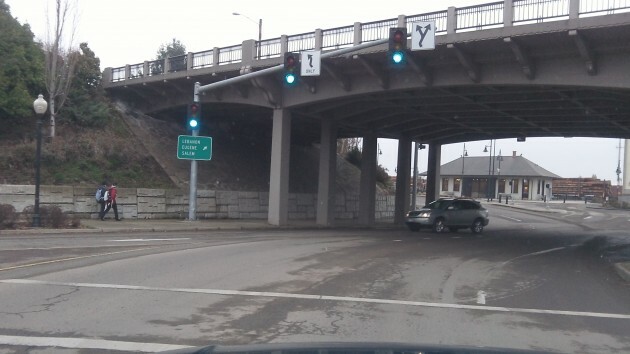 So, for lack of a more exciting topic at the moment, back to the traffic signals at Ninth Avenue and Lyon Street under Albany’s Pacific Boulevard overpass. As you can see here, another episode of waiting at the light on Dec. 17 yielded another snapshot of someone coming through the underpass after the signal on Ninth has turned to green. What’s going on, I asked Ron Irish, the city transportation systems analyst who knows more about Albany traffic than anyone else. These are state highway signals, and Irish has asked ODOT about them. The answer from ODOT is that the lights’ timing is fine, even featuring a brief interval of all red. Seems a couple of people with stop watches could find out the truth. A simple test may be to take a friend along. One of you on the Ninth St side, the other where you took the above picture. With your phones (or walkie-talkies?) have a conversation: “OK Hasso – the light *just* turned yellow/red – what do you see?” If the light on Ninth shows yellow or red – and you see green — the Ninth St driver is 100% at fault IMO. We did just that some years ago when the newspaper was trying to support the claim of a driver that he got an undeserved ticket for running a red light. We could detect no fault with the timing of the lights. What’s puzzling is that it is so common to see traffic under the underpass when Ninth Avenue has a green light. But Ron Irish explained it persuasively in his response to me. Seriously though, going downhill to a stop light that isn’t visible until you’re right at the very end, tends to make people go through yellow lights a little later than they would normally. Seems to me that a slight timing delay on the offending side would solve the problem. Having both intersections red for a couple of split seconds would solve the problem and cause fewer collisions at the intersection.